Brown the ground beef in large skillet. Add onion, garlic, and jalapeno. Cook the mixture for 3 to 5 minutes or until the onion has softened. Add the beans, broccoli and cheese soup, chicken soup, taco seasoning, corn, and salsa. Add a few dashes of hot sauce. Simmer until warm, about 10 minutes. Tear the tortillas into large pieces. 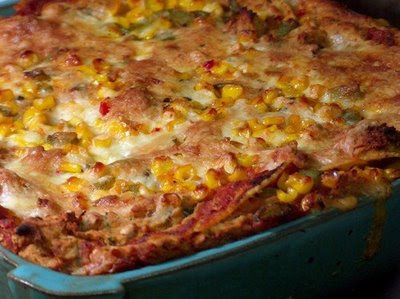 Grease the bottom of a large casserole dish with butter and then line the bottom with the torn tortilla pieces. Spoon on the ground beef mixture into a thin layer and then add a layer of cheese. Add another layer of tortillas and repeat with the beef mixture, finishing with a layer of cheese on top. Cover the casserole dish with foil to prevent the cheese from burning and place in the oven. Cook for 35 to 45 minutes. Remove from the oven, cut slices approximately 2 by 2 inches and serve. Garnish with chopped green onion.